Watch where you text and walk. It's a warning that many of us have heard before but some visitors to England's Salisbury Cathedral still haven't gotten the message. After a number of instances where patrons, too preoccupied with texting, walked into a 20-foot-tall sculpture of two clasped hands, the artist, Sophie Ryder, decided to move the piece to another spot on the property, according to artnet. The galvanized steel wire sculpture, titled The Kiss, is one of several that Ryder recently installed at the Cathedral. The collection is part of one of the artist's largest exhibitions. It was originally installed along a walkway, but distracted walkers had trouble clearing the archway. As a result, Ryder decided to save her artwork—and save patrons the embarrassment. She posted a video on Facebook and Instagram last week that showed the sculpture being lifted and placed onto the nearby grass where, in theory, it would be safer. Some fans commenting on the video were in favor of leaving the art where it was and blamed the texters for their own bad decisions. "Oh good grief," Cindy Billingsley wrote, "they should be looking at the beautiful art instead of texting—so they deserve what they get if they are not watching where they are going." 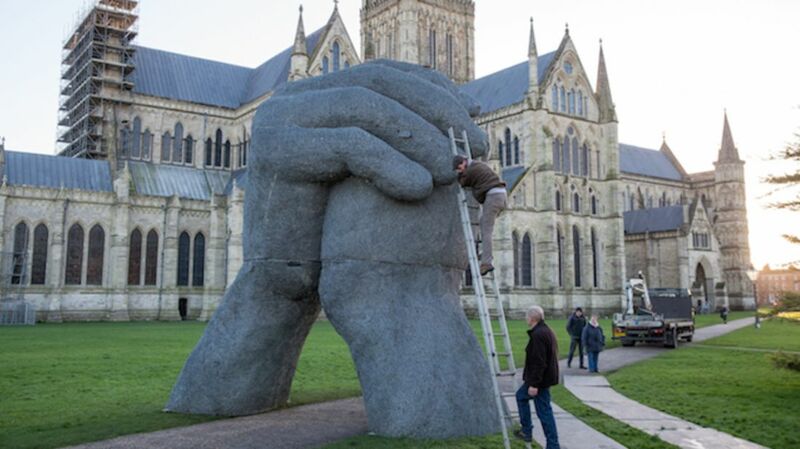 The sculpture and the rest of the exhibition can be seen at Salisbury Cathedral through July 3, with more sculptures scheduled to be installed inside on April 9.